Given my belief that sandwich perfection may have been achieved in the gloriousness that is a Tofu Banh Mi, it shouldn’t come as much of a surprise that I decided to see what other ways I could spin it. Turning the sandwich into a healthier, but equally as beautiful and delicious, salad seemed like the obvious thing to do. Because of the gorgeous rainbow of colors in the original Tofu Banh Mi, I decided to go with a vibrant and flavorful purple cabbage instead of a more mild lettuce. For a dressing I went with something light that complemented the pickled and soy sauce flavors. And in this version, I decided to bake the soy sauce marinated tofu, rather than sear it, to give it a firmer texture. Searing it works so well in the baguette sandwich because the soft texture of the seared tofu makes it easier to bite into on the hard baguette, but I didn’t want it to add a mush-factor to the otherwise crunchy, crisp salad. Other than that, all of the other elements are pretty much exactly the same as those in the sandwich. And man, oh man, were we satisfied with it… so satisfied that I see a soup version being born in the near future. So Stay Tuned! 4 20 mins. 25 mins. 45 mins. Pickle the vegetables by placing the carrots and radishes in a 16 ounce jar with 2 garlic cloves, ½ teaspoon ginger, ½ teaspoon crushed red pepper and ¼ teaspoon black pepper. Place the beets in an 8 ounce jar with 2 cloves of garlic, ½ teaspoon ginger, ½ teaspoon crushed red pepper, and ¼ teaspoon black pepper. Combine water, sugar, vinegars and salt in a small saucepan over low heat until sugar and salt have dissolved. Distribute vinegar mixture over the vegetables in the 2 jars. It should fill both, covering the vegetables in each jar. Refrigerate over night. Prepare the tofu by rinsing it and draining it. To drain it, you can either use a tofu press, or if you don’t have one, you can set a small plate upside down on a large plate. Place the tofu on the bottom side of the small plate and place another small plate on top of the tofu. Then place something of substantial weight on top of that plate. Let the excess moisture drain onto the large plate. After about 15 minutes, cut the tofu in half crosswise (essentially butterflying it into two thinner pieces). Then cut each half into uniform size cubes. Put the cubes in a bowl and season with garlic powder and black pepper. Toss gently until coated. Pour ¼ cup soy sauce over tofu, tossing occasionally to coat until ready to bake. Lightly grease a baking sheet with olive oil and arrange tofu on the sheet. Bake for approximately 25 minutes, flipping once during cooking, until tofu is crisp and firm, but still slightly tender. While the tofu is cooking, prepare cabbage by cutting it into thin shreds. You can slice a circular piece off the side and then cut that slice into strips. Continue until you have enough for the salads. Prepare the dressing by combing 2 tablespoons soy sauce, rice vinegar, light brown sugar, and sesame in a small jar. Shake together vigorously until combined. Use a vegetable peeler to slice cucumber into thin strips, peeling all sides until seeds are reached. Prepare sriracha-mayo by combining Vegenaise and sriracha. 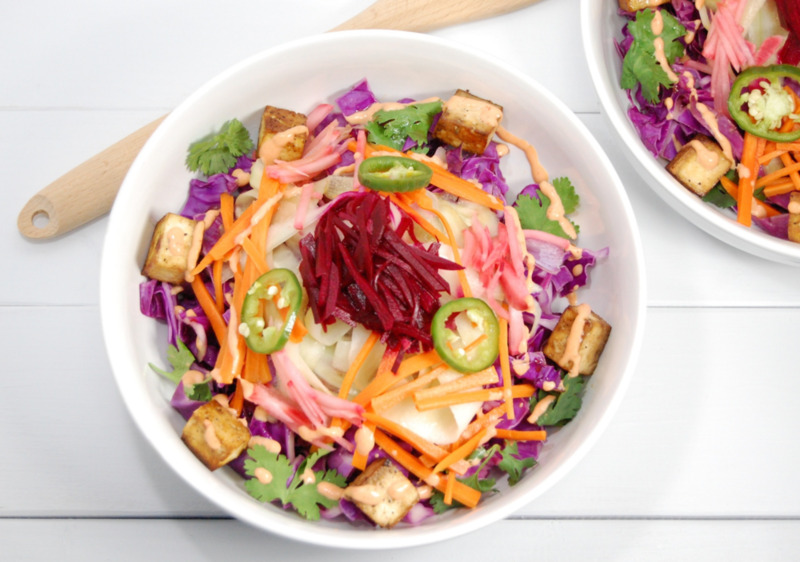 Prepare salad by topping cabbage with pickled veggies, cucumbers, cilantro, jalapeno, and tofu. Dress cabbage with soy sauce dressing and top tofu with sriracha-mayo. Serve and Enjoy! Leave off the jalapeno, sriracha-mayo and cilantro and make a toddler-friendly version for your little one!